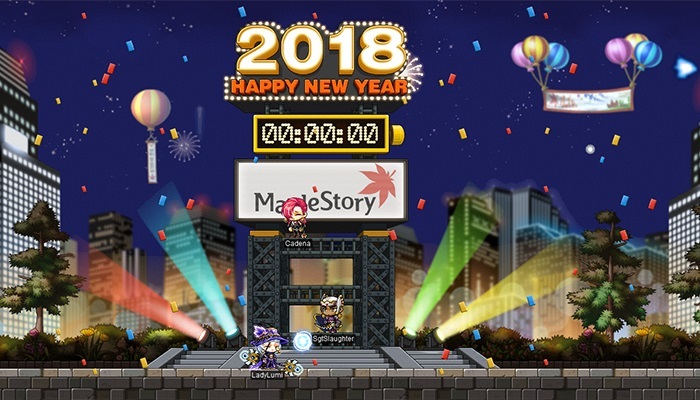 Celebrate the New Year: December 30 – January 1 | Dexless, Maplestory Guides and More! Discussion in 'Maple Updates' started by Nexon, Dec 30, 2017. Get ready to ring in 2018! Count down to the New Year, and then celebrate with a special limited-time shop and a Hot Day! Characters Lv. 33 and above can begin the event by accepting the quest '[Countdown] Together, Good-bye' from the event notifier on the left side of the screen, or by talking to NPC Cassandra. You’ll travel to the Good-bye Hill map where a countdown board ticks away the hours until the New Year! Relax and spend some with other Maplers while you wait for 2018 to arrive! The shop sells some limited-quantity items available for mesos, so get the goodies before someone else does. Pick up some trait items, restorative items, Explorer Random Face or Hair Coupons, a New Year's 3x EXP Coupon, a Happy New Year! Buff (gives Weapon ATT/Magic ATT +30 for 15 minutes), or a Happy New Year mount (permanent and 90-day versions available)! Celebrate the arrival of 2018 with a Hot Day! Get in-game for some great items! Log in with a character Lv. 30 or above, and click the gift box icon on the left side of the screen to receive a Gift Box, and then double-click the box in your inventory to open it. Once you receive the gift box, you can open it anytime before 1:00 AM PST / 4:00 AM EST / 10:00 AM CET / 8:00 PM AEDT of the following day. If you have more than 30 unclaimed gifts, you may not be able to see the Hot Day reward. Please clear any unclaimed gifts and login again to see the Hot Day reward. All rewards are for both Reboot and non-Reboot worlds unless specifically noted below. This event is available to players Lv. 30 and above (Zero characters must have completed up to Chapter 2). You can receive one gift box per account.